Submicron solid particles are dispersed through interstellar gas. These interstellar grains absorb and scatter light, thus shielding some regions from ultraviolet radiation, but also limiting our ability to detect photons which have been emitted by astronomical objects. Dust grains reradiate absorbed energy in the infrared, thus contributing to the overall emission spectrum of astronomical systems ranging from dusty disks around stars to ultraluminous starburst galaxies. A naked-eye view of the sky from a dark site on a clear summer night reveals dramatic dark patches in the Milky Way. These dark regions are not due to a deficiency of stars - they are instead the result of obscuration by dust clouds interposed between the Earth and distant stars. The obscuration tends to be greater at shorter wavelengths; as a result, the light reaching us from distant, obscured stars is "reddened". This reddening by interstellar dust can be understood as arising from scattering and absorption by a population of interstellar submicron dust grains. The grain population spans a range of sizes, from molecules (1) containing only tens of atoms to particles as large as ~ 0.3 µm, containing ~ 1010 atoms. Most of the grain mass appears to be due to two types of solid, in approximately equal amounts: (1) amorphous silicate mineral, and (2) carbonaceous material. A number of elements - including silicon and iron - are primarily in solid form in the interstellar medium. Approximately 2/3 of the interstellar carbon in diffuse clouds is in solid form (see INTERSTELLAR ABSORPTION LINES). It is of course important to characterize the wavelength-dependent interstellar extinction so that astronomical observations can be "corrected" for the obscuring effects of dust. In addition, the infrared emission from dust grains provides a valuable probe of dense regions, and the dust grains themselves play important roles in interstellar chemistry (shielding from ultraviolet radiation, and catalyzing the formation of H2), interstellar gas dynamics (radiation pressure forces on dust grains, and coupling of charged dust grains to magnetic fields) and heating and cooling of interstellar gas. Dust grains are central to many problems in modern astrophysics. Wavelength-dependent extinction - attenuation and "reddening" of the light from distant stars due to intervening dust (see Figure 1). Figure 1. Wavelength-dependent extinction, normalized to the extinction at I = 900 nm, for different types of clouds, identified by the value of RV AV/(AB - AV), where V = 550 nm and B = 440 nm. The average extinction for diffuse clouds is characterized by RV 3.1. Dense gas near the surfaces of molecular clouds can have RV as large as 5.5. The extinction at I is approximately proportional to NH = N(H) + 2N(H2) + N(H+), with AI / NH 2.6 × 10-26 m2 / H.
A strong and very broad extinction "bump" at 217.5nm (see Figure 1), probably due to carbonaceous material, perhaps graphite. Infrared extinction features at 9.7µm and 18µm, almost certainly due to silicates. A number of weaker "diffuse interstellar bands" (see Figure 2), the strongest of which are at 443 nm and 578 nm, and which remain generally unidentified. Figure 2. A portion of the extinction curve showing some of the "diffuse interstellar band" extinction features, labelled with their respective wavelengths. These diffuse bands may be due to impurities in grains, or to "free-flying" large molecules/ultrasmall grains. An absorption feature at 3.4 µm, seen in diffuse clouds, presumably due to the C-H stretching mode in aliphatic hydrocarbons. A number of absorption features, seen only in molecular clouds, due to ice mantles which apparently coat the grains in these regions. The strongest such feature is a 3.1µm feature attributed to H2O ice. Polarization of starlight - preferential attenuation of one linear polarization over another by aligned interstellar dust grains, so that initially unpolarized light from a star is partially polarized by the time it reaches the Earth (see POLARIZATION OF STARLIGHT). Reflection nebulae - dust clouds which are relatively close to bright stars, so that the starlight reflected by dust grains near the cloud surface renders the cloud visible (see REFLECTION NEBULAE). X-ray haloes around X-ray point sources located behind interstellar dust clouds. The haloes result from small-angle scattering of X-rays by interstellar dust grains. 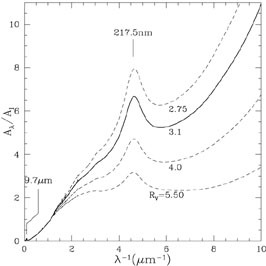 Infrared emission from dust grains heated by interstellar starlight (see Figure 3). Figure 3. 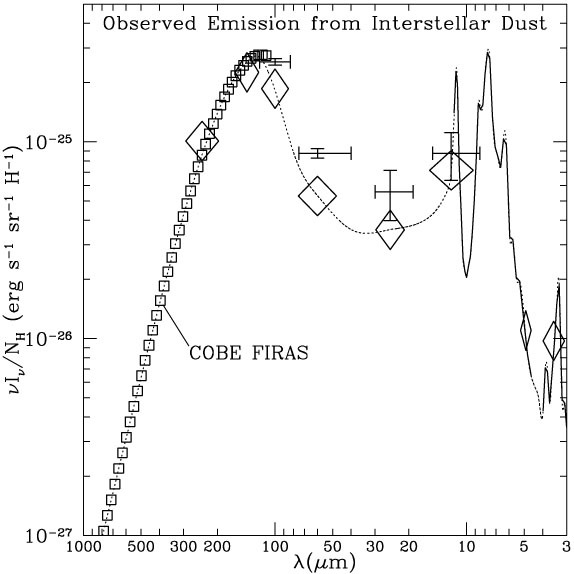 Infrared emission from interstellar dust grains from dust in diffuse clouds, per H nucleon. Crosses indicate data from the InfraRed Astronomy Satellite (IRAS) at 100, 60, 25, and 12 µm. Squares indicate data from the FIRAS instrument on the COsmic Background Explorer (COBE). Diamonds indicate data from the DIRBE instrument on COBE. The heavy solid line at 12 - 5 µm and 4.6 - 3 µm is the spectrum measured by the InfraRed Telescope in Space (IRTS). Infrared emission features indicative of aromatic hydrocarbons. 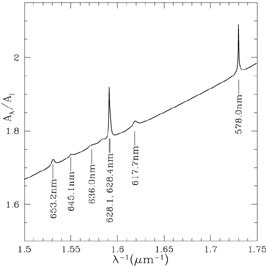 The strongest features from the general interstellar medium are at 11.3µm, and 7.7µm (see Figure 3). Emission features at 18µm and 9.7µm, generally thought to be due to silicates, from dust in regions with radiation fields 104 times stronger than the average starlight background. There is strong evidence for emission from interstellar grains in the far-red, presumably fluorescence following absorption of a shorter wavelength photon. In the local interstellar medium, the dust-to-gas ratio appears to be approximately constant - the dust follows the gas. Relic interstellar grains found in primitive "carbonaceous chondrite" meteorites. Impacts with interplanetary probes of interstellar grains passing through the solar system. Underabundances, relative to solar abundances, of certain elements in interstellar gas - including iron, silicon, magnesium, and carbon (see INTERSTELLAR ABSORPTION LINES). These elements are presumed to be underabundant in the gas phase because a large fraction of the atoms are locked up in interstellar grains. The presence in different parts of the interstellar medium of molecular hydrogen (H2) with abundances far exceeding what could be produced by purely gas-phase processes. The required rate of of H2 catalysis on interstellar grain surfaces provides information on interstellar grain properties, including total surface area. The "extinction curves" shown in Figure 1 represent the wavelength-dependent extinction A at wavelength observed on different kinds of sightlines. Careful studies of the extinction on many lines of sight reveals that the extinction curves can be approximately described by a one parameter family of extinction curves, and the curves shown in Figure 1 are obtained from fitting functions originally developed by Cardelli, Clayton, & Mathis (1989) and others. It is convenient to take RV AV / (AB - AV) as the parameter, where V = 550 nm and B = 440 nm. Values of RV as small as 2.75, and as large as 5.5, are observed in different regions. Grains in diffuse regions tend to have RV 3.1, while larger values of RV tend to be seen when studying the extinction by dust in dense clouds. Larger values of RV - corresponding to "greyer" extinction - are indicative of larger grains. The observed tendency for larger values of RV to be found in denser regions strongly suggests that characteristic grain sizes are larger in these regions. It can be shown that the increased values of RV cannot be explained simply by accretion of atoms and molecules from the gas phase - because of the very large amount of surface area contributed by the smaller grains, accretion from the gas phase would result in only a very small increase a in the radii of all grains, with minimal effect on the extinction at B and V. Instead, small grains must coagulate with larger grains to convert diffuse cloud dust to dense cloud dust. 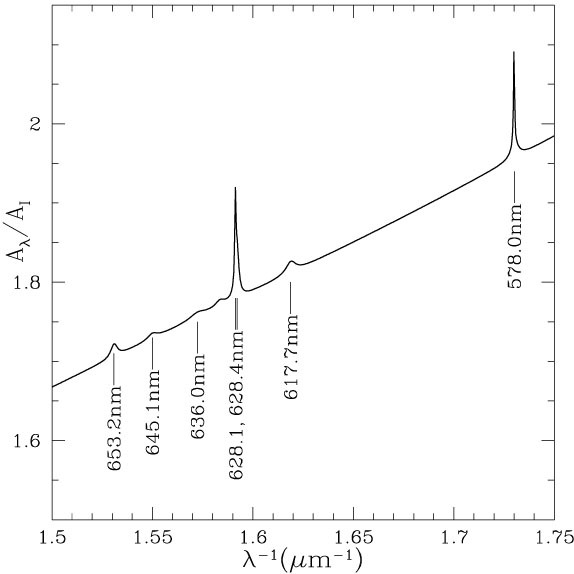 The strongest spectroscopic feature in the extinction curve is a conspicuous "bump" at 217.5 nm (see Figure 1). This feature has approximately the wavelength and width expected for small (radius a 15 nm) particles of graphite. While identification of the feature is still not certain, it appears highly likely that it is due to small carbonaceous particles with sp2 carbon-carbon bonds as in graphite and polycyclic aromatic hydrocarbons. The strength of the 217.5nm feature requires that ~ 15% of the solar abundance of carbon be present in small (a 5 nm) particles. Between 1.32 µm and 400 nm there are many weak diffuse extinction features, known as the "diffuse interstellar bands", or DIBs. Approximately 300 such features have been identified, with full width at half-maximum (FWHM) ranging from ~ 0.05 nm up to ~ 4 nm. The strongest DIB is at 442.9 nm. The first DIBs were recognized in 1934 by Merrill, yet they remain essentially unidentified to this date. They must be due to either "impurities" within dust grains, or to small free-flying molecules (i.e., ultrasmall dust grains). A few of the weaker features have been identified recently as electronic transitions of C7-, and it seems likely that many other of the DIBs are also produced by small hydrocarbon molecules, either neutral or charged (either positively or negatively). A broad extinction feature at 3.4 µm is attributed to the C-H stretching mode in aliphatic (chainlike) hydrocarbons. This feature is present in the diffuse interstellar medium. There are strong infrared extinction features peaking at 9.7 µm and 18 µm which are almost certainly due to amorphous silicates with a composition approximating that of olivine (MgxFe2-xSiO4). In regions where the dust is hot (e.g., circumstellar dust, or the dust near the Trapezium in the Orion Nebula), these features appear in emission. In some circumstellar dust shells and disks (e.g., the dusty disk around the Herbig Ae/Be star HD 100546), sharp features characteristic of crystalline silicates appear in emission, but these features have not been detected in either emission or absorption in the interstellar medium, indicating that the bulk of interstellar silicates are amorphous. In dark clouds, a number of additional features appear in the infrared extinction, presumably due to growth of molecular ice mantles on the refractory dust grain cores. The strongest feature is at 3.08 µm and is due to amorphous H2O ice. Additional features have been identified as frozen CH3OH (3.53 µm), CO (4.67 µm), CH4 (7.65 µm), and CO2 (15.2 µm). When initially unpolarized starlight passes through the dusty interstellar medium, it acquires both linear and circular polarization. The linear polarization is due to preferential attenuation of one linear polarization over the other, due to a population of nonspherical dust grains which are somehow aligned. The linear polarization peaks near V = 550 nm, with peak polarization P 0.03AV. The circular polarization, generally quite small, is due to conversion of linear to circular polarization when the alignment direction of the dust grains undergoes a twist along the line-of-sight to the source. Spinning dust grains have magnetic moments antiparallel to their angular velocities, and the angular momentum therefore precesses around the local galactic magnetic field. As a result, the observed direction of starlight linear polarization must be either parallel or perpendicular to the projection of the magnetic field on the sky. Theories of grain alignment lead us to expect the grain angular momentum to tend to align with the magnetic field, and the "long" axis of the grains to tend to be perpendicular to the angular momentum. The long axis of the grain therefore tends to be perpendicular to the magnetic field, and as a result light becomes linearly polarized parallel to the projection of the magnetic field on the plane of the sky. Our understanding of the physics of dust grain alignment is not yet complete, but it appears that the observed alignment in diffuse clouds is produced mainly by a combination of paramagnetic dissipation (originally proposed by Davis and Greenstein in 1951) and radiative torques on irregular dust grains due to anisotropic starlight. In some cases the alignment may result from drift of the dust grains through the gas cloud. Reflection nebulae such as NGC2023 or the beautiful filamentary structures near the Pleaides show that dust grains scatter starlight. While most conspicuous when a bright star is located near the surface of a dense clouds, reflected starlight also manifests itself as the "diffuse galactic light" - reflected starlight seen in all directions in the sky where there is dust. Measurements of the surface brightness of reflection nebulae, or of the diffuse galactic light, provide constraints on the scattering properties of interstellar dust grains - both the total "albedo" = Csca / Cext, and the angular dependence of the scattering, often characterized by g <cos > , where is the scattering angle. At visible wavelengths, the albedo 0.5 and the grains are moderately forward-scattering, g 0.5, consistent with current models for interstellar grains which reproduce the wavelength-dependent extinction as well as the infrared emission from dust. Scattering by dust grains can also be observed at X-ray wavelengths. A grain is essentially transparent to h 0.5 keV X-ray photons. Since the refractive index of the grain material is very close to 1, the scattering can be calculated in the "Rayleigh-Gans" approximation, and one finds that only small-angle scattering is expected. X-ray halos around compact X-ray sources have been imaged by the Einstein and ROSAT observatories; the observed X-ray halos appear to be approximately consistent with the scattering expected for a grain model developed to account for the optical-UV extinction curve. Observations of reflection nebulae (e.g., NGC 7023) as well as the general interstellar diffuse clouds or "cirrus" appear to show evidence of far-red continuum radiation in excess of what is expected from simple scattering of starlight by dust grains. The far-red emission peaks near ~ 700 nm, and has a spectrum resembling the luminescence from hydrogenated amorphous carbon illuminated by 550 nm radiation. This suggests that some of the grain material may resemble hydrogenated amorphous carbon, although ultrasmall silicon grains have also been proposed as the source of the emission. Even if it is assumed that hydrogenated amorphous carbon is responsible for the observed emission, an accurate estimate of the quantity of material required is not possible, since luminescence efficiencies of hydrogenated amorphous carbon in the laboratory depend on the preparation of the sample. Starlight is in part absorbed by dust grains, and the absorbed energy is reradiated by dust grains in the infrared. The observed emission spectrum for interstellar dust is shown in Figure 3. It consists of far-infrared emission peaking at 140 µm, plus substantial emission at shorter wavelengths. The emission at < 12 µm shows conspicuous emission features at 11.3, 8.6, 7.7, 6.2, and 3.3 µm; emission peaks at these same wavelengths have also been observed from reflection nebulae, planetary nebulae, HII regions, and circumstellar dust. The emission features have been identified as characteristic of polycyclic aromatic hydrocarbons (PAHs): C-H stretch (3.3 µm), C-C stretch (6.2 and 7.7 µm), in-plane C-H bend (8.6 µm) and out-of-plane C-H bend (11.3 µm). Variations in the relative strengths and precise wavelengths of these features from one object to another may be due to changes in the PAH mixture, including changes in the fraction which are positively or negatively charged. 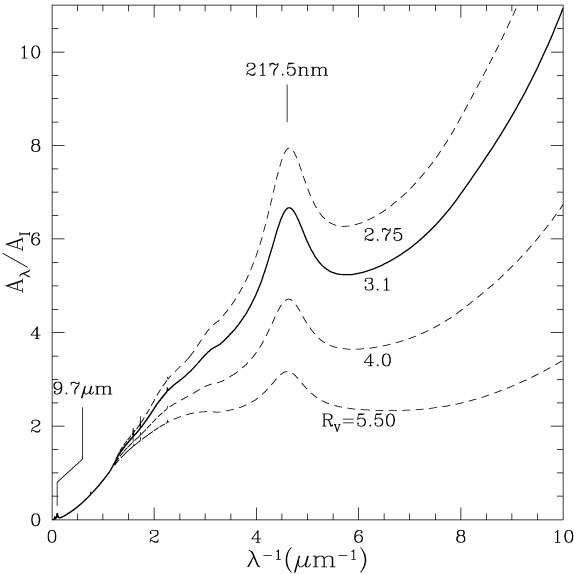 The "classical" grains with radii 0.01 - 0.3 µm radiate a spectrum characteristic of thermal emission at the (steady) temperature of the grain, ~ 15-20 K for grains in the diffuse interstellar medium. This accounts for nearly all of the emission at > 60 µm. For very small grains, however, absorption of a single starlight photon can appreciably change the grain temperature. For example, a single photon of energy h = 10 eV can heat a 230 atom graphite grain to a peak temperature T 300 K. At this temperature the grain can radiate effectively at wavelengths as short as 8 µm. The observed emission feature near 7.7 µm could therefore be due to thermal emission from grains with ~ 100 - 300 atoms. The relatively large amount of power radiated at < 10 µm requires that the grains with 300 atoms account for an appreciable fraction ( 15%) of the total absorption of starlight by interstellar grains. Sensitive observations of the cosmic microwave background radiation have revealed 10-60 GHz emission from interstellar matter with intensities greatly exceeding what would be expected from an extrapolation of the thermal far-infrared emission to these lower frequencies. It appears likely that the observed 10-60 GHz emission is largely rotational electric dipole emission from very rapidly rotating ultrasmall grains, although a fraction of the radiation could be thermal emission from grains containing materials that are ferromagnetic (e.g., metallic Fe inclusions) or ferrimagnetic (e.g., magnetite Fe3O4). The solar system was formed out of interstellar gas and dust approximately 4.5 billion years ago. The formation of planetesimals and planets was accompanied in many cases by high temperatures and violent conditions, and most interstellar dust particles were destroyed. However, the class of meteorites known as carbonaceous chondrites (see METEORITES) contain small particles with unusual isotopic ratios (see ISOTOPIC ANOMALIES) which indicate that they did not form in the solar nebula, but rather must have been formed in a region with an anomalous composition (e.g., outflow from an evolved star) long before the formation of the solar system. Therefore these particles must have been part of the interstellar grain population prior to the formation of the solar nebula. To date, 5 different type of presolar grains have been isolated and identified (see Table 1). The evidence that the grains listed in Table 1 were truly interstellar is compelling, but it is important to realize that they apparently do not include typical interstellar grains, for the simple reason that the procedures used to isolate interstellar grains in meteorites are designed to deliberately destroy silicate material (which comprises the bulk of the carbonaceous chondrite meteorite "matrix"). These laboratory procedures are therefore not going to find interstellar silicate grains even if they are present. Detectors aboard the Ulysses and Galileo probes measured impacts by interplanetary dust particles, but also observed impacts attributed to the flux of interstellar grains expected due to the 20 km s-1 motion of the Sun relative to the local interstellar medium. The detectors are sensitive only to collisions with the large-size end of the interstellar grain distribution, but the observed distribution of impact energies appears to be consistent with both the overall numbers and size distribution expected based on studies of interstellar extinction. The lines of evidence listed above serve to strongly constrain theoretical models for the interstellar grain population. Unfortunately, interstellar grain researchers have thus far not been able to uniquely determine the grain model from the available observational constraints, so debates continue concerning the details. The grain population must have a broad size distribution, with grain radii (4) covering the range 0.5nm - 300nm - a factor of at least 108 in grain mass. Most of the grain mass is in particles with radii 50 a 300 nm. Most of the grain area is in particles with radii a 50 nm. Approximately 50% of the grain mass in diffuse clouds is contributed by amorphous silicate material, accounting for the broad 9.7µm and 18µm silicate features. Most of the silicon, iron, and magnesium abundance is in solid form. Approximately 50% of the grain mass in diffuse clouds is contributed by carbonaceous material. Approximately 2/3 of the total carbon abundance is in solid form. The 217.5nm feature is probably due to some form of carbonaceous material, possibly graphitic. It is not possible to invert the observations to obtain a unique grain model. Instead, one makes some assumptions concerning the grain composition and the form of the size distribution, and then attempts to adjust the model to achieve a good match to the observed interstellar extinction, infrared emission, and other constraints such as observed gas phase abundances. One grain model which has proven fairly successful in conforming to observations consists of a mixture of carbon grains and silicate grains. The carbon grain material is taken to have the optical constants of crystalline graphite. A good fit to the extinction can be obtained if both graphite and silicate grains have size distributions which are approximately a power-law, dn / da a-3.5, truncated at amin 5 nm and amax 250 nm. The 217.5 nm feature is then reproduced by the a 5 nm graphite grains. This grain model - the combination of graphite and silicate grains, and the dn / da a-3.5 power-law - was first put forward in 1977 by Mathis, Rumpl, and Nordsieck, and is often referred to as the "MRN" model. The MRN model achieves a good fit to the RV = 3.1 extinction curve for diffuse clouds with essentially all of the Mg, Si, and Fe in the silicate grains, and approximately 2/3 of the C in the graphite grains, in reasonable agreement with observed depletions. The grains are heated to temperatures ~ 18 K by starlight, and the resulting thermal emission is approximately consistent with the observed far-infrared emission at > 60 µm. Unfortunately, the original graphite-silicate grain model described above fails to reproduce the < 50 µm infrared emission shown in Figure 3. The model lacks the ultrasmall grain component required to explain the observed 3 50 µm infrared emission from interstellar dust. The simplest modification is to allow the carbon grain distribution to extend down to very small sizes, with the smallest grains assumed to have infrared optical properties suitable to explain the emission features at 3.3, 6.2, 7.6, 8.6, and 11.2 µm when heated to the appropriate temperatures by absorption of single starlight photons. In order to have sufficient numbers of ultrasmall grains, while still reproducing the extinction curve, the size distribution of at least the carbonaceous grains can no longer be approximated by a single power-law. Other grain models, with different grain geometries and/or compositions, have been proposed to account for the observed interstellar extinction and infrared emission. Mathis and Whiffen proposed a grain model wherein the larger grains are porous aggregates of small graphite and silicate particles. Some authors have favored metal oxides (MgO, SiO, FeO) either in addition to, or in place of, silicates. Some models assume the silicate grains in diffuse clouds to be coated with a carbonaceous "mantle" material, which might be hydrogenated amorphous carbon. Metallic Fe and FeS incorporate significant fractions of the Fe in some grain models. Small particles of crystalline silicon, with hydrogenated or oxidized surfaces, have been proposed as an explanation for the observed luminescence near ~ $700nm. Grain models generally tend to have the bulk of the Fe, Mg, Si in dust, approximately 2/3 of the C, and about 20% of the O, resulting in dust-to-gas mass ratios of ~ 0.007. Gas drag forces when the grain velocity differs from that of the gas. In addition to direct collisions with atoms and ions, there is also a "plasma drag" force on charged grains due to momentum transfer with ions which do not actually collide with the grain. For subsonic motion, the plasma drag force is typically a factor ~ 20 - 30 larger than the drag due to direct collisions with ions. Electromagnetic forces on charged grains. Since there is usually a "plasma" reference frame in which the electric field is very small (interstellar plasma being a very good conductor), the electromagnetic force can be attributed to the Lorentz force F = Q(v / c) × B Lorentz force, where Q is the grain charge, B is the magnetic field and v is the grain velocity relative to the plasma. Scattering and absorption of photons ("radiation pressure") when the grain is illuminated by an anisotropic radiation field. Poynting-Robertson drag, as when a grain is moving perpendicular to a directional radiation field. While not normally important in the interstellar medium, Poynting-Robertson drag can be very important for dust grains orbiting stars (see INTERPLANETARY DUST). Recoil forces when photoelectrons or photodesorbed molecules are emitted anistropically from a grain which is illuminated by an anisotropic ultraviolet radiation field. Gravitational force. In clouds supported by gas pressure, dust grains will tend to "sediment" toward the minimum of the gravitational potential. Because the gas and grains are subject to different forces, the dust grains generally have a drift velocity relative to the gas. In typical diffuse clouds, anisotropic starlight can result in drift velocities of order ~ 0.1 km s-1. In regions with strongly anisotropic ultraviolet radiation fields (such as photodissociation regions) the drift velocities can be larger. Collisions with gas atoms and molecules. Recoil associated with photoelectric emission. Recoil associated with H2 formation on the grain surface. Absorption and scattering of starlight by an asymmetric grain. The interstellar magnetic field acting on the magnetic dipole moment resulting from the Barnett effect in a spinning grain. The interstellar magnetic field acting on the magnetization induced in the spinning grain by the interstellar magnetic field (the "Davis-Greenstein" torque associated with paramagnetic dissipation). Because the interstellar medium is far from thermodynamic equilibrium, some of these torques can act systematically. Grains can be driven to rotational kinetic energies much larger than kTgas (where Tgas is the gas temperature) by collisions with gas atoms and molecules (because the grain and gas temperatures differ), by photoelectric emission or by absorption and scattering of starlight (because the starlight radiation field is not in thermodynamic equilibrium with the grain temperature), and by H2 formation (because the H2 abundance and gas and grain temperatures are not in thermodynamic equilibrium). Gradual alignment of the grain angular momentum with the magnetic field can be produced by paramagnetic dissipation (because the grain rotational kinetic energy is not in thermodynamic equilibrium with the "vibrational" temperature of the grain). Perhaps the most important effect of interstellar dust grains is their role in heating the gas via photoelectric emission. When a dust grain absorbs an ultraviolet photon of energy h , there is a probability Y(h ) - often referred to as the "yield" - that a photoelectron will escape from the grain surface and thermalize with the local gas. When this happens, the kinetic energy of the emitted electron (at "infinity", since the grain it is escaping from may be charged) acts to heat the interstellar medium. On average, grains must capture electrons as rapidly as they are ejected, and the net heating rate then is equal to the difference between the mean energy of the emitted electrons and the captured electrons. Since photoelectric yields Y may be of order ~ 10%, and since the kinetic energy of the electron at infinity may be of order ~ 1 eV (if the grain is not highly positively charged) the photoelectric heating mechanism - at best - converts ~ few % of the absorbed ultraviolet starlight energy into heating of the gas. While this ~ few % conversion efficiency may seem small, the availability of energy in starlight is so great that photoelectric heating is generally the dominant heating mechanism for diffuse interstellar gas. In astrophysics, anisotropic radiation fields are the rule, rather than the exception, and these anisotropic radiation fields can have dynamical consequences for dust and gas. Circumstellar grains are of course subject to extremely anisotropic radiation from the star. At a typical point in the interstellar medium, the nonuniform distribution of stars in the galaxy, together with patchy obscuration by interstellar dust, results in starlight with appreciable anisotropy. The dipole component of the starlight anisotropy may be typically ~ 10%. When the radiation field is anisotropic, scattering and absorption by the grain produces a net force on the grain, commonly referred to as the "radiation pressure" force. If the grain is coupled collisionally to the gas by gas drag and perhaps magnetic fields, then the force exerted on the grains is transmitted to the gas. These radiation pressure forces can dominate the dynamics of gas in certain regions, such as dust-forming winds from cool stars. Interstellar chemistry largely starts with the catalysis of H2 on interstellar grain surfaces (see INTERSTELLAR CHEMISTRY). The inferred production rate of H2 in the interstellar medium requires that an appreciable fraction of the H atoms arriving at interstellar grains surfaces must leave the grains as part of H2 molecules. While the details of the kinetics remain uncertain, the overall picture is broadly as follows: When an H atom in a diffuse cloud arrives at a grain surface, it has a high probability of sticking. The H atom then explores some fraction of the grain surface by either thermal diffusion or quantum tunnelling, until it either finds another H atom with which it can recombine to form H2, or it arrives at a location on the grain surface where the binding by either van der Waals forces ("physisorption") or formation of a chemical bond ("chemisorption") is strong enough that it becomes trapped. If such trapping occurs, then the surface coverage of trapped H atoms builds up until newly-arrived H atoms have an appreciable probability of reacting with a previously-trapped H atom rather than becoming trapped themselves, or the adsorbed H atoms are removed by some other process (e.g., photodesorption or thermal desorption). Dynamically important magnetic fields are commonly present in interstellar gas (see INTERSTELLAR MAGNETIC FIELDS). In dense molecular gas with very low fractional ionization, a large fraction of the "free" charge resides on positively and negatively charged dust grains. Under these conditions - which prevail in high density regions in molecular clouds, and presumably in protostellar disks - dust grains dominate the coupling of magnetic fields to the gas, since the neutral gas atoms and molecules themselves are not directly coupled to the magnetic field. The charged dust grains are coupled both to the magnetic field (by Lorentz forces) and to the neutral gas (by collisional drag). As a result, the grains will drift with a velocity which is intermediate between the velocity of the neutral gas and the velocity with which the magnetic field lines (and plasma) "slip" through the neutral gas. Thus the dust grains determine the rate of "ambipolar diffusion" of magnetic field lines in dense molecular regions. Charged dust grains play a similar role in the dynamics of magnetohydrodynamic shock waves in gas of low fractional ionization but dynamically significant magnetic fields. While interstellar grains are observed to be ubiquitous, it is not obvious that this should be so. In the violent interstellar medium (see INTERSTELLAR MATTER, SUPERNOVA REMNANTS), grains can be destroyed when the gas which they are in is overtaken by a shock wave with shock speed vs 200 km s-1, as is expected in supernova blastwaves. Estimates of the rate of occurrence of supernovae, together with models for the resulting blastwaves, lead one to estimate that the mass in interstellar grains will be returned to the gas phase on a timescale of ~ 5 × 108 yr, short compared to the age of the Galaxy and the interstellar medium. We know that grains are injected into the interstellar medium in outflows from cool red giants and supergiants, and even in supernova ejecta, but if there were no conversion of gaseous atoms back to solid form in the interstellar medium, we would expect very little grain material to be present at any time. In particular, even for elements like Fe we would expect most of the atoms to be in the gas phase. The fact that this is not so - that most of the interstellar Fe is in fact missing from the gas phase - requires that there be efficient recondensation of Fe, Si, Ca, and other elements back into solid form in the interstellar medium. The "mineralogy" of interstellar grains must therefore largely reflect the surface chemistry which will occur on the surfaces of interstellar grains. Dust in the Galactic Environment, by D.C.B. 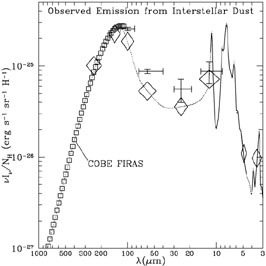 Whittet (London: IOP Publishing; 1992), provides an excellent overall description of interstellar dust grains. The observed optical properties of dust have been recently reviewed by J.S. Mathis (1990), Ann. Rev. Astr. Astrophys., 28, 37. The ultrasmall grain population is discussed by Puget, J.L., & Leger, A. (1989), Ann. Rev. Astr. Astrophys., 27, 161. An overall review of interstellar and circumstellar dust is given by Dorschner, J., & Henning, T. (1995), Astr. Astrophys. Rev., 6, 271. 1 Since all grains are "molecules", it is natural to consider small molecules as the small-size end of the overall grain population. Back. 2 Mass fraction in "primitive" carbonaceous chondrite meteorites. Back. 3 SiC and graphite grains sometimes contain very small TiC, ZrC, and MoC inclusions. Back. 4 The particles are of course not spherical. By grain "radius" we refer to the radius of a sphere of equal volume. Back.